Few months ago I had written an article titled “ Few Old Samatya Characters”. In the article I had told the readers the stories of Fisherman Toma, Tatar Osman, owner of the Bol Kepce restaurant (plentiful spoon) , and an old lady who was a librarian.The article gained immediate recognition and readers especially in the Bakirkoy, Kocamustafapasa and Samatya Districts started sending me positive comments and anecdotes of their own from the area. Among these readers was Selim, a friend with whom I had shared lots of memories during our graduate studies at the Pennsylvania State University in 1973. Selim who was currently living in this area not only liked the article but he also shared it with his groups of friends with whom he corresponded frequently over the internet. I hadn’t seen Selim for a long time, so I told him the next time I am in Istanbul I was planning to walk down from Kocamustafapasa down hill to Samatya and maybe we can meet and have a cup of tea together. Since part of my childhood was spent in the Kocamustafapasa I had few memories of Samatya which was then a subsection of that district. Samatya was then a summer resort area of the people living in Kocamustafapasa. We used to go to our neighbors yali (summer house) there, swim and play on the sandy beach and return home tired climbing up the hill to the old wooden house by the Sumbul Efendi Mosque. I remember seeing small churches behind high yellow painted brick walls, row houses with balconies, old ladies dressed in black as I climbed up the cobblestone streets. Sometimes back home in America I had walked down these streets in my dreams. And after few decades I had visited Samatya once again in real life. It was fall of 2002 and my mother who was in her early eighties had accompanied me during this walk. We first visited the tombs in the courtyard of the Sumbul Efendi Mosque, then walking by the Kocamustafapasa Elementary School where she had gone to school, we took the cobblestone streets down hill to Samatya. Once in a while we stopped for a breather and checked our surroundings to recognize a familiar place from the past. But for my mother people walking in the streets were more important than the surroundings. She kept saying ,” it seems to me that I recognize these people walking in the streets, as if I have known them before”. My mother's childhood was mostly spent in this area but Samatya as she knew did not exist anymore. Selim’s group of friends are all intellectual people who are concerned and greatly involved in day to day problems of the country. They keep sending emails and forwarding articles to each other over the internet and discussing and arguing about political issues. Since my article,” Few Old Samatya Characters”, was forwarded back and forth in this internet traffic and gained some interest, some of his friends wanted to join us during our planned trip to Samatya. They said “we can not only tour and visit some of the historical place in Samatya and may be later on we can find a place to eat and talk”. I had no problem with that and started searching places of interest from Google to visit: The Armenian Church of Surp Kevork, Sulu Manastir (The Monastery with the water well), the Greek Churches of Hagia Christiano and Hagia Nicola, the Bath of Haci Kadin, the Mosques of Imrahor Ilyas Bey and Haci Huseyin. We needed a special permission to tour the The Surp Kevork Church since it was closed to visitors during weekdays. My friend from Canada, Dr. Masis Perk got this permission for us by writing to his friend from college Dr.Avedis who was a lifelong resident of Samatya. As the days to our tour # 6 neared, the number of people who were interested joining the tour was increasing. Selim was predicting this number to be around 15- 16 people. “We need to move on guys , we have to be at the “Monastery with the Well” in ten minutes to meet Dr. Avedis Demir ”. While climbing up the stairs painted inrainbow colors I called Dr Avedis on my cell. We kept walking on the Marmara Street. Three women, one older than the other, all with long black dresses and jackets and black shoes, were choosing “Kirkagac” melons from a street vendor's pushcart. The older lady had a head scarf covering her white hair, the other two with their black dyed hair had their hair in the open. Passing by a small mosque we saw another street vendor who was wearing a grey shalvar, the baggy old fashioned peasant trousers. He was taking out oranges and mandarins from wooden containers and stowing them on his cart. He had a flat skullcap on his head, a black vest and a thick long beard. It seemed interesting to me that while the Government took the initials of T.C. ( Initials standing for Turkish Republic) from most of the Government Buildings, it was still here by an Armenian school. In front of the school building there was a big Turkish flag and on the flagpoles in the backcourt two more Turkish flags were in sight. And on the side of the building there was a banner with the script : Cumhuriyet’in 80. Yili ( The Republic’s 80 th anniversary) with a painted flag on the banner. All kinds of Baptism and Wedding Organizations. We kissed each other from cheek as if we were friends of forty years. Standing by the gate of the church grounds Dr. Avedis gave us the history of the church and schools as well as the abandoned Patriarchy standing like skeleton across the street. One of the first things Sultan Mehmet the Conqueror did in Istanbul after taking over in 1453 was to start reconstruction of the city which was in shambles. During the conquest several churches kept fighting back. The churches whose communities refused to surrender were later to be converted to mosques.The ones who obeyed him were permitted to continue their churches . Nine years after the conquest Sultan Mehmet brought Armenians living in Tokat and Sivas provinces, who were known for their architectural and artistic skills, to Istanbul and settled them in Samatya . He gave the monastery known as Peribleptos or the “monastery with the well” , to the Armenian community and appointed Havagim Yebisgobis , whom he knew from Bursa, as the head of the monastery and Episkopos of Armenian churches. The Armenian community which settled in Samatya in 1461 kept the the “monastery with the well” and also built the first Armenian church and a boys high school on the monastery grounds. Later on in 1831 a girls school was built on the same grounds which is still in function today. The Patriarchy which continued it’s existence here for 200 years was moved to Kumkapi later on because of the increased population of the Armenian community in this district, but the church in Samatya kept serving the community’s needs. Throughout its history Samatya got it’s share from the frequent fires of Istanbul and during the third biggest fire in 1866 the Surp Kevork Church , schools and shops belonging to the church foundation were all burned down. Following the fire the wealthy people of the community got together and started raising money to rebuild the schools first. A silver tradesman named Gumuscu Kaspar Aga donated all the money to reconstruct the Sahakyan Nunyan Schools.The next step was to find the source for 6000 gold coins to rebuild the church. Michael and Hovannes brothers, two well known merchants donated 2000 golds themselves and the church built from cut stone, designed by Bedros Nemtze, was rebuilt with the help of volunteer workers and artisan in thirty months. The church, monastery and school complex , thanks to the help of Armenian foundations and donations from the community, survived to our day by going through several alterations. The graves of two brothers , Kaspar Aga and Hovannes who were instrumental in rebuilding the church and schools, are also situated on the Surp Kevork Church grounds. When Avedis Bey was finished telling us the history of the complex, we all moved inside through the iron gate. What can not be seen from the outside because of the high walls was in sight now: several buildings next or attached to each other: Preschool, Elementary School, Middle School, administrative buildings of the church and foundation and sarcophagus of few graves. Apparently a funeral ceremony had just ended and people were assembled in front of the church, built all from white cut stone. On the huge white door of the church there was a relief on black and gold background, describing how St. George was tortured and beheaded. In the little hallway at the entrance on the right, there was a painting of St. George whom the Armenians call Kevork, on a rearing white horse. The rectangular building had real high ceilings and arched windows on both sides. The sunlight was coming through the stain glass windows and forming a beautiful contrast with the white and purple motives of the ceiling. Contrary to the dark and nightly atmosphere of the Greek churches this church was reminding me more of the morning and the sunrise. As we walked through the aisle towards the podium where the preachers gave their sermon, colors started changing to purple and to a carnation red. There were work of art: gold gilded thrones, paintings and frescoes of saints, crosses and huge gold plated candle sticks. Inside the church Dr. Avedis introduced our group to Yesayi Demir Bey, Head of the church and Armenian community foundations. Yesari Demir Bey started telling us how Sultan Mehmed the Conqueror took the monastery from the Greeks and gave to Armenians. Trusting the same information was on the three page, typewritten handout he handed out, I left the group and started taking pictures. There was a little baptism chamber on the left at the back end of the church. A very knowledgeable church official gave me very detailed information here in front of the water basin, from the holy water to the special soap and added that anybody who was not baptized would not be considered a Christian. Once out of the church this time we went to another building nearby to visit the holy water well. 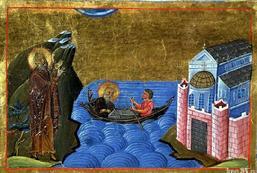 As Avedis Bey explained, holly water wells and holly springs are typical of Greek churches. Here inside the building, using wooden stairs and holding on to the railings we went down the ground level, just like in the Marmaray metro tunnel. There at the bottom was a little chapel which could only host about 20- 25 people. Here by the conregation area there were few more steps of concrete stairs going down to the well. The well was covered by a wooden cover and since the water is not considered safe, drinking was not allowed anymore. Abi* please take our pictures! I noticed almost every corner of the courtyard was going through reconstruction and renovation. While walking with my friend I noticed that we had lost track of our tour group. Soon we found them in the office of the head priest sitting around his table in a half circle and listening to his speech. Of course once our intellectual friends were in the room, they did not miss the opportunity to ask the priest questions about the different denominations of Christianity and he in turn gave them a thirty minute speech giving them information and very diplomatic answers. When he was finished they thanked him and Yesari Demir Bey and left the premises to go to the Haci Kadin Bath with Dr. Avedis, our new tour guide. Of course I captured the moment with my camera. On the main street there was a Greek Orthodox church with a high bell tower, but since the doors are locked we could not go in. We turned back to the side streets again and noticed the long and narrow chimney of the famous Haci Kadin Bath, resembling that of a small factory. Unfortunately we are out of luck, today the use of the bath was designated to women. We couldn't go in but our lady friends went in and at least checked the lobby area with the little fountain. Next to the Turkish Bath there was a little mosque built by somebody named Ahmet Dede. The mosque built from red bricks was restored in 1970 and has a wooden gate door inside of an arch of its courtyard walls. Just like the churches in the area the door was locked for security reasons. Now we started going down a slope, there in the distance we noticed the broken minaret of the Imrahor Mosque. The minaret was cut off from it’s sherefe, the balcony where the imam calls people to prayer. Behind this mosque and behind the high walls and trees, there were the the red brick walls and white cut stones of the oldest standing church in Istanbul, which now looked like a skeleton.The ceiling and roof on top of the walls were missing, but the walls just like most walls on the streets of the area were decorated with graffiti in white paint. The Monastery of Stoudios aka Imrahor Mosque (Not to be confused with Imrahor Mosque in Uskudar) has still its walls standing up of the oldest surviving church remains of Istanbul. The monastery was built in the year 462 A.D. by the Roman Patriarch Studios and lead the way to many Orthodox churches in the world since then. Although in 741 Emperor Constantine exiled many Orthodox priests here and most of them were tortured and killed, the Orthodox priests kept coming here to continue their religious activities. The church which accepted St George as their leader was the center of religious poetry, literature and music between the 8 th and 11 centuries. Most of the music of the rituals sang in Orthodox churches around the world today, was written, composed and sang here in Studios Monastery for the first time. In 1290 the monastery was greatly destroyed and plundered by the crusaders and stayed closed until it was reconstructed and reopened in 1290. The St George church was converted to to a mosque by the Ottoman Sultan Beyazid II with the name Imrahor Ilyas Bey. Both the church and the monastery was burned down twice in 1782 and 1920 and knocked down by a big earthquake in 1894 . After the earthquake some Russian archeologists opened up an archeological center here but with the Russian revolution of 1917 this activity was also ceased. During the early years of the Turkish Republic the monastery stayed abandoned and in ruins and local people often stole and used bricks and stones of the monastery to restore their houses. The monastery ruins also known as the the Monastery Monument was first planned to be used as a museum, but later it was decided by the government to be reconstructed and used as a mosque. The ownership of the property was taken from the Ministry of Culture and given to a foundation and it is expected to reopen as a mosque in 2014. The owner of the Cihan Derya Fish Shop (Universe and Seas) was a younger man, who ordered tea from the nearby coffee house. After chatting and having the cup of freshly brewed tea, I said goodbye to my new friends. On the second floor of the Develi restaurant there was a table set, waiting for our tour group. Here we were treated to a meat feast with continuous cold and hot appetizers, the green Efe raki the traditional Turkish spirit and hours long conversation with friends.